My name is Ivan Gestigator. I am an Austrian journalist in deep cover at Swarthmore College. In all likelihood, you know me and consider me a friend. I could be anyone so don’t look for me. I am undercover because, while my investigations put me and my love ones at great risk, after much deliberation I have decided that the truth must come out. It must ring out from the silenced bells of Clothier and in the bellows of the fire moose. It is time the Swarthmore student body knew: Dean Zil Nuarb is a lizard-person. I have been collecting evidence for the past three years and have collected a plethora of evidence to attest to Nuarb’s reptilian nature. The first piece of evidence comes from deep in the dean’s records. It was actually my hacking of Dean Nuarb’s computers that led to the institution of the Duo authentication program. While perusing the dean’s records, I found a tantalizing morsel of information. It turns out that Zil Nuarb never completed her college-mandated swim test. You may ask, “Why was I forced to enter the icy waters of that pool while the dean was not?” As a lizard-person, Nuarb is endowed with a form of mind control that is particularly potent against bureaucrats. Thus the dean could have bypassed Warner’s draconian swimming requirements with nothing more than a well-timed hiss. But why didn’t she just take the swim test? The answer to that question is in her biology. As a reptilian, Zil is exothermic. For those of you unacquainted with the most noble of fields that is biology, that means that if she gets cold, she dies. It all makes sense if you think about it. My second piece of evidence lies in the fact that she is oviparous. For you non-biology lame-os, that means that she lays eggs. On one of my weekly break-ins of dean Nuarb’s office, I made a startling discovery. While checking under the radiator I found a nest of torn-up copies of the Phoenix with three giant green eggs inside. She seemed to be using the periodical to incubate her young in the warmth of all its hot takes. You may say, “What if she didn’t lay the eggs?” When I reported the newspaper nest under the radiator to Pub Safe as a fire hazard, the responding officers came to find three tiny versions of Dean Nuarb running around her office. These officers have since disappeared. Nonetheless, the eggs were clearly laid by the dean herself. And since lizards lay eggs, it follows that Dean Nuarb is a lizard-person. Thirdly, while attending a weekly coffee talk I saw something disturbing. Yes, while sipping my cuppa joe I saw her eat a cricket. The cricket was just minding its own business walking around Sci Commons, and the dean just stuck out her 4-foot tongue and ate it straight off the floor. Yes, straight off the floor. Totally unsanitary. Hundreds of people walk on that floor. But as a lizard-person, Dean Nuarb does not care for human hygienic standards — she has the immune system of a crocodilian. For those of you majoring in lesser, non-biological areas of study, crocodilian immune systems are lit. This is all just more evidence to attest to Nuarb’s reptilian nature. The next piece of evidence concerns one of the dean’s closest associates, president Lav H’tims. Like many shady characters, Dean Nuarb is incriminated by her associations with other known lizard-people. For those of you who are behind on the latest news, President H’tims was recently revealed to be a lizard-person through her ties to the fossil fuel industry. Some of you cool bio kids might note that most lizards do not partake in social interaction with their own kind. You would, of course, be correct. But you fail to note that Nuarb is not a lizard but a lizard-person. People are notably social and thus, so too, are lizard-people. Finally, why is she trying so hard to convince everyone that she is a bare-white woman? Seems pretty suspicious. The supposed evidence of her humanity is all revealed here: dean-nuarb-is-not-a-lizard.com (seriously, check it out). That sure is a sketchy web address; it makes one wonder what she’s hiding. Well, I’m here to tell you, she is hiding that she is, in fact, a lizard-person. All I’m saying is that only a lizard-person would write an article about how they were a white woman. Wake up sheeple. So there you have it folks. Dean Nuarb is a lizard-person. What does this mean for the college and the student body? Nothing. Absolutely nothing. 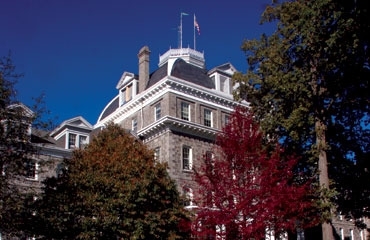 Swarthmore has been run by lizard-people since its founding. It actually turns out that “Swarthmore College” translates to “a place to give humans anxiety” in the ancient language of the lizard-people. It all makes sense now, doesn’t it? Now that the truth is out there, you must go about your business as usual, and I must return to the shadows.